A teenage boy who has not been named but is thought to have been a fifth year student, was rushed to Aberdeen Royal Infirmary after he was attacked yesterday afternoon. 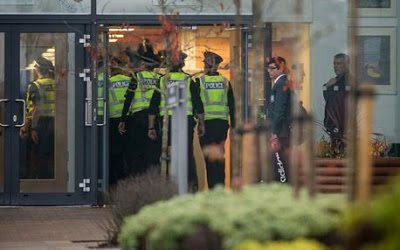 The shocking incident happened at the Cults Academy school in Aberdeen and reports suggest he was stabbed in a hallway. Police in Scotland have detained a 16-year-old boy in connection to the murder. Posting to Twitter, Aberdeen Police revealed they had launched a murder investigation following the attack. “This is a shocking and extraordinary incident for Aberdeen and firstly our thoughts are with the family and friends of the boy who has sadly lost his life today. “A full and thorough enquiry is underway and there will be a police presence in the area for the foreseeable future. Aberdeen Council said: “It is with shock and sadness that we can confirm that a pupil of Cults Academy has died following an incident at the school earlier today. “Our heartfelt sympathies are extended to the friends and family. Traumatised school friends who witnessed the attack claimed it followed a verbal altercation in which one boy had been called fat. During the row the suspect produced a penknife and allegedly stabbed Bailey once in the stomach. Staff at the secondary school raced to his aid and tried to stem the flow of blood from the wound, while paramedics were called. Police Scotland confirmed the victim was rushed to Aberdeen Royal Infirmary but he was declared dead around two hours later.